Both Hogg and Bunyard write that the variety was grown early in the nineteenth century at Wadhurst. It is currently cultivated as part of Brighton Permaculture Trust’s -:- National Collection in Stanmer Park, Brighton. You can see a Wadhurst Pippin apple tree (planted 2010) in Home Farm Orchard, Stanmer Park ( map). The fruit is large and variable in shape, tall to intermediate, rectangular to truncate or conic. It is strongly ribbed on the eye and on the body of the fruit. The skin is yellow tinged green and flushed brownish-red, streaked crimson. The fruit has a savoury, spicy taste with quite a sharp, hard flesh. 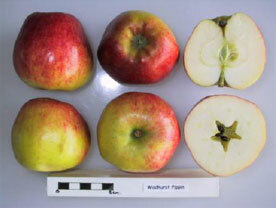 The Wadhurst Pippin is a very good cooking apple. The fruit can be picked in early October and stored until February. The Wadhurst Pippin is a vigorous upright tree.